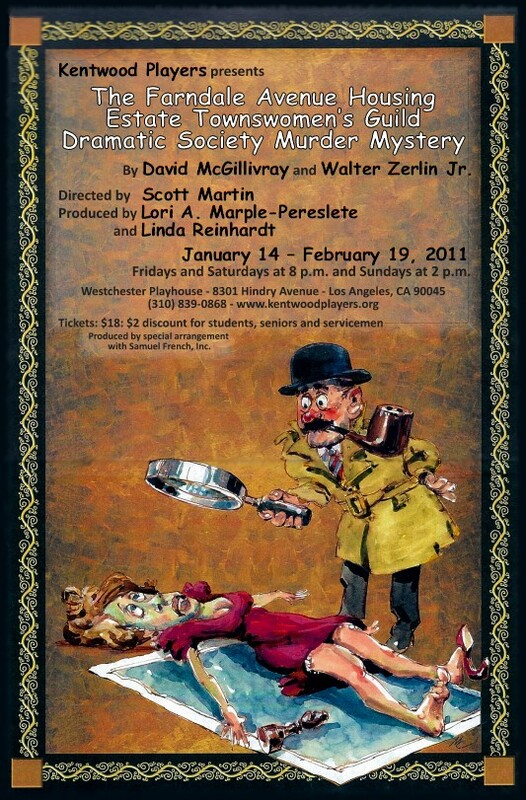 The Farndale Avenue Housing Estate Townswomen’s Guild Dramatic Society Murder Mystery by David McGillivray and Walter Zerlin Jr. is a hilarious farce that spoofs the detective thriller genre. The plot involves the overly-ambitious and talent-challenged middle-aged ladies of a working class British village who present their hysterical community theatre production of an original Agatha Christie-type whodunit called Murder at Checkmate Manor. As is typical for these dingbat divas, everything that can go wrong, does. From forgotten lines and missed cues to lost props and broken furniture to multiple costume changes and lighting and sound effects that all could have used more rehearsal time, the ladies valiantly insist on entertaining you against your will and guarantee to bring down the house -- or at least a substantial part of the set. Every clue must be examined at Checkmate Manor. Everyone is a helpless pawn at Checkmate Manor. The Checkmate Manor killer strikes again! Chief Inspector O'Reilly exposes the killer. Chief Inspector O'Reilly questions the usual suspects. The Checkmate Manor killer takes aim! The Checkmate Manor killer starts thinning the herd. It’s hunting season at Checkmate Manor! Chief Inspector O'Reilly looks for clues in the latest Checkmate Manor murder. Good help is really hard to find at Checkmate Manor.